When the LADWP uses paper water, not only does it affect Los Angeles residents, it also impacts utilities and residents outside of the city. 'Paper water' is water that “utilities claim they have access to, but is difficult or impossible to access for various reasons”. When the LADWP claims to have access to more city owned domestic water than it really has access to, that allows the department to understate how much water it needs from the Metropolitan Water District. 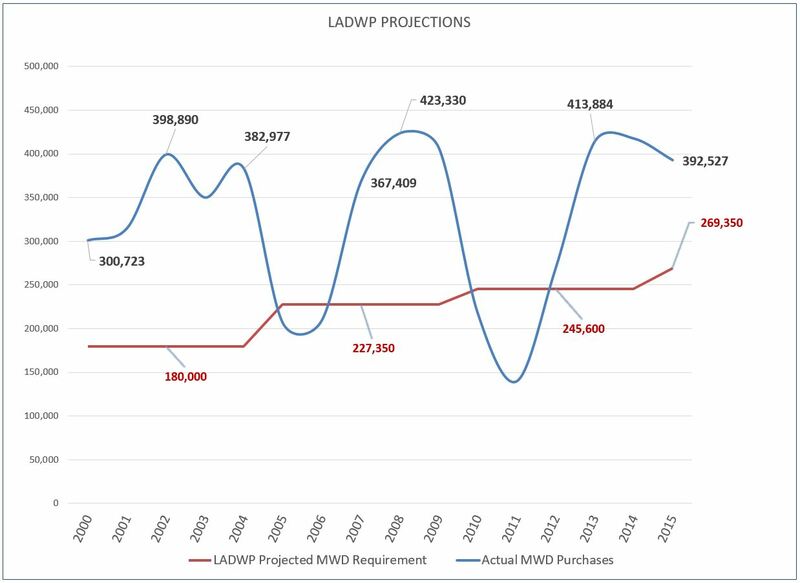 Using paper water to prop up the perception of its domestic supply, the 2000 UWMP* suggested that the LADWP would only need to purchase and additional 3.53 million acre-feet of water between 2000 and 2015. However the department was unable to follow through on its claims. Only 4 times in 16 years did the department meet its own projections. Over the other years it had to purchase 47% more water from the MWD amounting to 5.20 million acre-feet at a greater unit cost. This is one of the ways that the department hides the water shortage in the EIR's that work their way through the planning process to shield development. Obviously this practice would impact the MWD's operations to store surplus water as a hedge against drought in its Diamond Valley Reservoir and at Lake Mead. *I used the 2000 UWMP because it presented a larger sample size of MWD purchases than later plans would. Later UWMP's use paper water similarly. Can you buy paper water? Absolutely. Today the LADWP sent out an agenda for an upcoming meeting of the LADWP Board of Commissioners. One of the agenda items on it was the NoHo West project Water Supply Assessment with a recommendation by LADWP Water Systems section for the Board to approve it. Like other WSA's this one is no different. The requirement for a water supply assessment comes from the California's 'Show Me the Water' legislation. This WSA like the other LADWP water supply assessments fails to do that. Most urban water agencies like the LADWP have upended SB-610 and turned it into a pay to play permit that offers paper water to help approve projects for a fee. For $17,000 the department will produce a report full of Imaginary Water that will get your project approved. At that price you should expect a very elaborate highly detailed report but in reality the LADWP provides a little more than 20 pages of analysis along with 160 pages of poorly rendered photocopies that have little relevance to the projects analysis except for what the city Planning department provides. That comes out to about $800 a page. The rest of the report is primarily a crude cut and paste job that offers no extra insight to the water supply for decision makers to base their decision on. The first 21 pages of the WSA goes on to describe the 742 unit project that's also full of retail and office space. It estimates how much water demand the project will impose on the city and it feigns on how much the extra conservation the LADWP was able to negotiate out of the developer to reduce demand. Not surprisingly it ends with a conclusion that this projects 298 Af/y is accounted for in the City's 2010 Urban Water Management Plan even though its not. This is essentially where the analysis ends. At page 22 the department inserts twenty pages of stale, highly inaccurate supply projections into the report and goes on to describe the city's water supply infrastructure, environmental constraints and conservation measures. All of this information is already available in the City's UWMP. At page 51 the department inserts a letter from the City Planning Department that makes the request for the WSA. The Planning Department letter actually has more original material in the WSA than what LADWP contributes for its part. At page 67 the department then inserts a few letters from the developers agent describing the various proposed alternatives for the project are inserted into the WSA. $17,000 would seem to be an outrageous amount of money if it just ended there. So here the LADWP stuffs in a bunch of over copied, poorly rendered filler that adds little value to fatten up the report another 101 pages. None of this extra information provides anything useful for assessing whether the project might be an undue burden to the city's residents or if there really is sufficient water supply. In fact it may be a distraction meant to discourage the reader from seriously reading it and asking further questions during the approval process. In this section we find what might be the most copied court judgement ever, the City's groundwater adjudication which claims what rights the city has to San Fernando Groundwater Basin. This document has little relevance to the NoHo West project. Its presence serves to give the reader the impression that the department has its act together even though it failed miserably in delivering what groundwater it claims it has to the city residents. Then we get to page 88 for the obligatory piece of CA water code that requires retail water agencies like the LADWP to produce a water supply assessment for projects that are 500 units or larger just in case those projects are not accounted for in the city's UWMP. Despite the legislations name however, the LADWP doesn't really show us or the Board of Commissioners any water. Just paper water. Then we get to the biggest chunk of this cut and paste job because the report is still pretty thin. The Metropolitan Water District should get royalties on these 86 pages each time it shows up in a WSA. Oddly, this half of the WSA's 180 pages comes from the very agency the City says it doesn't need much anymore and it's going cut 50% of its purchases from. The MWD contribution is guaranteed to put any bureaucrat asleep since it's mostly devoted to bond money and negotiations with other water agencies to keep our reservoirs full. They are full aren't they? Despite the $17,000 price tag, it's money well spent for the projects developer. Even after two and a half decades of falling water supplies and emergency drought ordinances, that $17,000 buys them confidence that the LADWP will identify just enough paper water to usher their project through. How good is that!